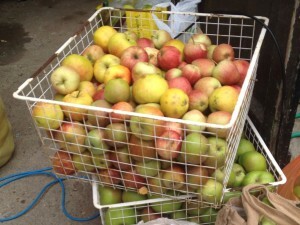 It’s that time of year again, when the windfall apples under your tree beg to be put to good use…. and what better use than to make them into juice to cheer you up through the winter? Our kit of electric apple crusher, apple press (20 litre or 12 litre size) and pasteuriser is available to hire again for the princely sum of £10 a day, or £15 a day at weekends. Details on our Make your own apple juice poster 2016 here. You can save that by making 6 bottles of juice! You will need to collect it yourself and return it or hand it on to the next hirer in good condition. This entry was posted in Economics, Food, recycling, Skill-sharing. Bookmark the permalink.